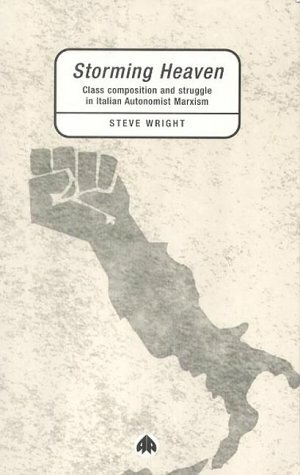 Class composition and struggle in Italian Autonomist Marxism. It is the first historical work on Italian operaismo that breaks with the memorialist-autobiographical tradition and the widespread production of perfunctory and often dismissive accounts available so far. Wright uses the concept of 'class composition' as an explanatory thread that runs through the peculiar political and intellectual affairs of Italian operaismo. In doing so, he recognises the importance of a concept that even some operaisti often neglected or regarded as a mere criteria of pure empirical research, secondary to 'Great Political Theory' (on the state, the party, the revolution, class, general intellect, and so on). Wright rightly emphasises that the notion of 'class composition' is closely related to the approach of 'conricerca' (joint research) and that both concepts refer us back to a typically operaista manner of forging collaborations between intellectuals and workers or intellectuals and the proletariat in the broadest sense, based on different reasons from those characteristic of the relation between party and class in the Second, Third and Fourth Internationals. The Italian operaisti aimed to be neither 'class vanguard' nor political class or 'small party', and thus experienced to the bitter end the contradictions of exercising political theory whilst simultaneously refusing traditional models of organisation. Whilst questioning the reasons why Italian operaismo has long remained unknown in the Anglo-Saxon world, Wright observes that the circulation of the writings of Negri, Tronti, Alquati and Virno was only possible due to the work of a few volunteers, such as Ed Emery . We should probably add to this the extraordinary success of Negri & Hardt's Empire. The first chapter of Storming Heaven outlines the currents and political figures of the Italian post-war period of the 1940's and 1950's that sought a 'Left' alternative to the politics of the PCI and in particular those of Togliatti. Our attention is immediately drawn to people like Morandi and Raniero Panzieri; the latter was the founder and coordinator of the journal Quaderni Rossi, around whom for the first time all the protagonists of Italian operaismo came together in an editorial board. The second chapter is of great importance because it expounds with clarity the basic theoretical framework of Italian operaismo through an intelligent reading of Mario Tronti's work on factory and society, published in Quaderni Rossi. Tronti's work innovates XXth century Marxism through a re-reading of Volume II of Marx's Das Kapital and manages to introduce elements of great originality (Tronti's discoveries). Tronti lays down the 'foundations' of operaismo. The very notion of class composition was an attempt to translate into practice some of the concepts that Tronti had first clarified. A full appreciation of the importance and significance of Tronti's writings of that period provides Steve Wright with the key to the reconstruction of the history of Italian operaismo. Wright also grasps the 'novelty' of Quaderni Rossi at the intellectual level and the extent to which it shook up the Italian workers' movement and awakened it from the crisis it had undergone since the defeats of the early 1950s. The 'novelty' of Quaderni Rossi consisted in the inchiesta operaia (workers' enquiry). To the pressing question of where to start from, this publication replied: 'from an understanding of the working class, of the 'new' working class, and more precisely of the mentality of the new generations that, fighting the police in the streets in July 1960, had defended a democracy from the new outbursts of fascism'. Romano Alquati is the main figure behind workers' enquiry of the Marxian approach. He lays down the methodology of conricerca (joint research) with Romolo Gobbi and Gianfranco Faina. The latter is not mentioned in Steve Wright's book but he occupied a central role in this initial stage of Italian operaismo. Faina used to teach History at the University of Genoa when the city was the epicentre of the uprisings of July 1960 that brought to a standstill the neo-authoritarian experiment of Tambroni's government. He took part in the experiences of Classe Operaia but did not join Potere Operaio. He had relations with anarchist groups who were involved in armed struggle during the 1970s. He was put in jail and died there of cancer in 1981 (see the memoir published in Primo Maggio, no. 19/20, Winter 1983/84 by Rinaldo Manstretta and Pierpaolo Poggio). Wright deals with Alquati's contribution to the phase that preceded the birth of operaismo on pages 46-58, after a section on Panzieri (p. 41-46). Panzieri opened up the way for new theoretical developments with his re-reading of Volume I of Das Kapital. He focused his attention on the relationship between working class and technological development (the question of machines) and drew conclusions that were highly critical of the union culture of the CGIL and its subaltern acceptance of capitalist development. Panzieri problematises an issue that would be returned to and developed in the Quaderni Rossi and later: is it possible to have a sociology of labour and industry that is not at the service of technological development but rather of workers' struggle? As we know, Panzieri's question spurred a different way of doing sociology that would be a point of reference for some of the major Italian sociologists (Rieser, Mottura, Paci et al), who were in the editorial board of Quaderni Rossi at the time. Steve Wright's reply to these questions is curt, but the little he says is true: on the one hand, Panzieri's political objective was to produce a shift 'within' the workers' movement, the CGIL, the PSI (where he had been a member of the Central Committee) and the PCI; on the other hand, the others wanted to create a new movement that could develop in the post-communist era and to experiment with a new way of doing politics with the working class. At this point Toni Negri's role became central and decisive. More than anyone else, he had the 'will' to undertake such a project and he tried hard to convince Panzieri and Rieser that his path was the right one to take. (The definitive break occurred at the beginning of September 1963 in my room in Milan, in a flat that I shared with other two comrades from the Quaderni Rossi group). The choice of whether or not one operated from within the tradition of the working class movement also entailed the decision as to whether one approved of certain forms of wildcat struggle in the factory and violent confrontation in the streets, such as those that shook up Turin in the Summer of 1962, also known as the 'riots of Piazza Statuto', when the workers assaulted the offices of a union accused of siding with the bosses. The third chapter is dedicated entirely to an analysis of Tronti's and Alquati's writings on the Journal Classe Operaia and to the polemics they provoked. However, there are a number of gaps in the analysis: what is missing is a history of the journal and its multifaceted nature; it also evidently lacks an analysis of the role and contribution of Toni Negri, as well as an appreciation of the internationalism of Italian operaismo, thus of the formation of an idea of the multinational worker; there is also no mention of the intensification of the relations with the American Left, where Ferruccio Gambino had a fundamental role. All these missing elements strongly characterised the actions and above all the influence of operaista methodology on the 1968's students' movement, the comitati di base of 1968/69 and the movements of the 1970's. Therefore, what transpires is an operaismo reduced to few, yet essential, themes. Undoubtedly Tronti's article Lenin in England , published in the first issue of Classe Operaia, was a crucial turning point. The article opened up the 'strong' phase of operaismo whilst positing the premises for its first crisis, which resulted in another break up, the end of the two year old journal and the entry (or return) into the PCI of people like Tronti, Asor Rosa and Rita Di Leo. Lenin in England reintroduced the issue of the party -which was also known as the 'tactical' issue- into the debate and called for the militants to re-engage with institutional politics. It also enriched the theoretical tool-box with the paradigm of 'factory-society'. Romano Alquati and others, in particular those comrades who operated in cities with a strong working class presence (Milan, Turin, Porto Maghera), tried to understand the dynamics of working class movements and anticipate the moments of revolt and strike in order to link them with one another. Operaisti thought of themselves as working for 'class recomposition'. Classe Operaia was not only an extraordinary laboratory of ideas, it also put into motion new political experiences in cities with a high concentration of activists that would then spread in other environments. In Milan in 1964, Classe Operaia leaflets where distributed with political interventions that covered up to fifteen factories simultaneously between Milan, Sesto San Giovanni and other areas of the region and helped to spark off sudden struggles at Innocenti, a factory that produced light motorbikes and cars, that brought workers to march on and invade the city. The students' movement in Trento, home of a University founded in 1965 that was to become one of the epicentres of the 1968's students' struggles, came across Jimmy Boggs via Classe Operaia during an excellent meeting (I remember Jimmy's happy face when he hugged me for the enthusiastic welcome he and Grace Lee had received from the students). The group of young philosophers at the University of Milan, students of Enzo Paci (Nanni Filippini, Giairo Daghini, Paolo Gambazzi, Guido Neri, Paolo Caruso) and the psychology students of Cesare Musatti (such as Renato Pozzi) had close relations with Classe Operaia. For its innovative ideas, operaismo already appealed to young intellectuals before 1968. Many architects, urban planners and experts on territory, such as Alberto Magnaghi from Turin (who would then become general secretary of Potere Operaio in 1971) began to introduce the themes of operaismo in their disciplines. By the end of Classe Operaia in 1966, a core of new 'militants', who were to have a decisive role in 1968 and during the 1970s, had already formed in the younger generation. Many of them are still on the road. When the editorial board of Classe Operaia fell apart, the preparation -so to speak- for 1968 got underway. Steve Wright emphasises two important aspects: the introduction of the theme of 'technicians' (that will have much popularity in Science Departments and Polytechnics) and the participation of some operaisti in May '68 in France, followed by the publication of articles that offered an overall reading of the students' and workers' revolt in Paris. The French experience was passed on and 'filtered' in Italy by the operaisti. Some of the gaps in Wright's account have to do with the dynamics that led to the intervention in Fiat in Turin in the spring of 1969. Probably, in order to reconstruct with precision this event, which undoubtedly represented the greatest victory for operaismo, Wright would have needed to have access to archive material that is hard to find, especially the leaflets that were then distributed in the factories (this material used to be kept in the private collections of individual militants, but for the greatest part it has been confiscated and destroyed during and after the wave of arrests in 1979). The two booklets by Linea di Massa also had a crucial role. The first one of these, 'Lotte alle Pirelli', was written on the basis of an account given by one of the founders of the Comitato di Base at Pirelli in Milan, Raffaello De Mori; the second one, called 'Lotte dei tecnici alla Snam Progetti', the research laboratory of ENI (ente nazionale idrocarburi) in San Donato Milanese, was written on the basis of the accounts of technicians at the Comitato di Base (ENI is the State Oil company), who are still active in their territory to this day. These two booklets together with the journal La Classe, which first came out on May the 1st 1969, a month before the break out of spontaneous struggles at FIAT in Turin (June-July 1969), represented the apex of the parabola of Italian operaismo. During the crucial years that determined the fate of the revolutionary movement in Italy (1967, 1968, Spring 1969) Milan and its region were the places where the most advanced experiences met, from the groups that referred to the Chinese revolution (Edizioni Oriente), to the support networks of the South American guerrilla in Venezuela, Bolivia and Peru' (Fanon Centre) to the publishing houses and centres of historical research (Feltrinelli and G.G. Feltrinelli library), to the editorial boards of journals such as Quaderni Piacentini, and the workers' organisations of the car industry (Alfa Romeo, Innocenti, O.M., Pirelli, Magneti Marelli), to the chemical and pharmaceutical factories (Snia Viscosa, Montecatini, Farmitalia, Carlo Erba), to the factories of heavy and fine machinery (Siemens, Breda, Falck, T.I.B.B.) to the laboratories of the oil industry of ENI and the offices of industrial marketing design of Olivetti. All these places were invested in or contaminated by the operaismo of the 1960's. After the outbreak of the Fiat struggles and the cycle of strikes also known as 'Hot Autumn' (June-December 1969) it is not surprising that in Milan we start to witness the occurrence of state terrorism (12 December 1969, the bomb in Piazza Fontana). Some weeks before Francesco Tolin, the director of the newspaper Potere Operaio, had been arrested. The following two chapters in the book deal respectively with Toni Negri and his theory of the socialised worker, and the work of the journal Primo Maggio. The militant activism of the groups that referred to Toni Negri and the journal Rosso still thought of their own task in terms of political organisation (not as separate from the movement but intrinsic to the movement itself), whilst the group of Primo Maggio saw itself merely as an editorial board. Wright's decision to place these two together in a single political path is both odd and interesting, because they worked on two completely different levels and arose from different and divergent political backgrounds. Therefore, it is a choice that puzzles at first and it is unclear how far the reader will perceive this by reading Steve Wright's reconstruction. The chapter on Toni Negri satisfies well the need to understand what 'Autonomia Operaia' was, both in its political form and as theory of revolution. However, it is necessary to make a clear demarcation between the phase of gestation of this new tendency (1973-1975) and the moment when the tendency meets a 'new' movement, the first post-'68 movement made up of a different generation from ten years before. The relation between the journal Rosso and the movement of 1977 (as it was named due to the year it briefly exploded in Italy) is like that between Classe Operaia and the 1968 movement. A new organisational structure was set up in Padova and its region, partly from the ashes of Potere Operaio, partly from the generation of militants brought up after 1968. This structure called itself Autonomia Operaia but was in fact mainly made up of students and young proletarians. Similar groups are set up in other cities, partly arising from the ashes of extra parliamentary groups, partly from the new generation; however, despite the incarceration of almost all of its members in 1979-1980 and 1981 (who was not arrested went into exile) the Padova group (and then Mestre and Venice) remained the strongest and lasted longest and created the ground that still represents one of the strongest realities of the Italian movement, a movement that has radically changed its nature over the years, especially in the refusal of violence and of the actions of violent struggle. Primo Maggio was a whole different story. While it is true that its founders were members of Potere Operaio (Lapo Berti, Franco Gori, Andrea Battinelli, Guido de Masi, myself), its main focus was on placing itself within a network of initiatives of self organisation at the level of political culture and formation 'at the service of the movement'. Primo Moroni's bookshop Calusca in Milan was the most original and important of these initiatives. If Primo Maggio had not joined this network, it would have never exercised the influence that is only today being recognised. From this standpoint, Steve Wright is right to place it in the tradition of Italian operaismo. In fact while Primo Maggio explicitly recognised itself in that experience and openly claimed continuity with it, for Negri operaismo was already dead in 1973 and the history of operaismo was concluded with the end of Classe Operaia. Primo Maggio was also able to produce interesting, new and forward looking material in the analyses of financial capital, the welfare state, history and class composition because its editorial board comprised of comrades who differed in age and experience from 'classical operaismo', such as Cesare Bermani, Bruno Cartosio, Marco Revelli, Christian Marazzi and Marcello Messori. The fundamental difference between Primo Maggio and Autonomia Operaia and the reason it seems wrong and confusing to put them in the same basket lies in their concept of their roles as intellectuals. At Primo Maggio, we aimed to change the rules of the status of disciplines; we were interested in innovating in the areas of the methodology of history, sociology, economics and political science. We felt very close to journals such as Sapere, which had a similar role in the field of scientific disciplines (physics, medicine etc. ); but since we did not think of ourselves as new Braudels or Einsteins or Webers, we, like the comrades at Sapere, felt that in the end the most important objective was that of changing the 'social role' of the university lecturer, doctor, physicist, sociologist, lawyer, architect and so on. On this premise the role of the political intellectual needed to change too, from being a new Lenin or a new Robespierre, into being a 'service provider' for the decentralised movement, capable of offering the movement a better understanding of itself, of opening up new possibilities. This is how we prematurely came to perceive that the Fordist mode of production was declining to give way to a new mode of production, now conventionally called 'postfordism', which contained in itself both elements of liberation from work, and elements of increased capitalist exploitation. In the last chapter, 'The collapse of workerism', Wright analyses the attitudes of Autonomia Operaia and the group of Primo Maggio towards the movement of 1977. It comes across as the last effort of a political generation born in the 1960's to keep up with events. It struggled to do so but, rereading what we wrote then, it did so with dignity. However, events travelled too fast and eventually overwhelmed us. In 1978 the Red Brigades' kidnapping of Aldo Moro completely changed the mood within the groups of Autonomia Operaia, which felt crushed between on the one side a state that reorganised to respond to the terrorist attack and on the other by the armed groups who kept 'raising the stakes'. In 1979 Toni Negri and all the comrades who partook in Potere Operaio up until 1973 were arrested, others escaped abroad (some are still in exile). In the autumn of 1980 FIAT imposed mass lay-offs and a thirty-five day long strike opened up an impossible struggle that ended with the most bitter and deepest workers' defeat since the 1950's. To give an idea of the tragic nature of the defeat for the Fiat workers, it suffices to say that in the following months more than a hundred suicides were reported. Around five thousands militants of the new movement were arrested or forced to flee abroad, one thousand of them were convicted to more than ten years in jail. Rather than dwelling on these events, which are known and amply present in the literature, Wright focuses in detail on the dynamics that led to the last class confrontation at FIAT (1978-1980) in the chapter entitled 'The family Gasparazzo goes to Fiat'. That was also the topic of the last 'enquiry' of operaismo into Fiat. In his brief conclusion Wright lists the weaknesses of operaismo, that are probably at the basis of its extinction as a political theory of the present: 'The first of these consists in its penchant for all-embracing categories that, in seeking to explain everything, too often would clarify very little (...) another of the more obvious weaknesses of Italian workerism ...would be a too narrow focus upon what Marx termed the immediate process of production as the essential source of working-class experience and struggle" (p. 225). The third weakness is 'political impatience'. We can only agree with him, even though it is also true, as he writes later, quoting an English comrade, that 'the questions that it posed then, as two decades before, stubbornly refuse to go away" and that, quoting an Italian comrade, "the best way to defend workerism today is to go beyond it" (p. 227). I would like to conclude with a question that might interest those, if they exist, who will in the future take up the history of operaismo. Is it possible to apply the category of continuity to this movement? Doesn't continuity belong to the traditional methods of writing history? Is it not proper to the history of dynasties and parties? Those who, from the beginning, positioned themselves outside of a party perspective, who regarded the revolution as a lifeblood rather than an event, do they have a right to continuity, do they have to be subjected to it? Perhaps the exploration into the methods of history and the labour of the historian, that started with Primo Maggio and was recovered in the 1990's by Altre Ragioni and then by LUMHI (Libera UniversitÃ di Milano e del suo Hinterland-a project that was still born but might be destined to re-emerge in the new Italian political climate) is not yet concluded. *This essay first appeared in German in Sozial.Geschichte and was then translated for Strategies; thanks to the editors of these journals for permission to publish it here.